KMLT holds a 57 acre conservation easement covering the Lauderdale Lakes Country Club. This public golf course is a regulation 9-hole course located six miles north of Elkhorn on Hwy 12/67. Since 2003, a conservation easement permanently protects the golf course and an adjacent wetland. The purpose of the easement is to assure that the property will be retained forever in its natural, open and wetland state and to prohibit any use that will significantly impair or interfere with its conservation values. The conservation easement recognizes three different zones that permit various uses. The Park Zone, Municipal Zone and Wetland Zone are all protected from subdivision. 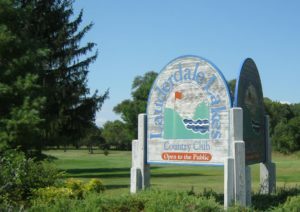 The Lauderdale Lakes Country Club is owned and operated by the Lauderdale Lakes Lake Management District, a special purpose unit of government.